Background: The introduction of Immune Checkpoint Inhibitors in the recent years has resulted in high response rates and extended survival in patients with metastatic/advanced malignancies. Their mechanism of action is the indirect activation of cytotoxic T-cells through the blockade of inhibitory receptors of immunomodulatory pathways, such as cytotoxic T-lymphocyte-associated antigen-4 (CTLA-4), programmed cell death protein-1 (PD-1) and its ligand (PD-L1). Despite their impressive therapeutic results, they can also induce immune-related toxicity, affecting various organs, including the skin. Objective: To provide an updated summarized overview of the most common immune-mediated cutaneous side effects and their management. Method: English articles derived from the databases PubMed and SCOPUS and published between 2009 and 2018, were analyzed for this narrative review. Results: The most common adverse cutaneous reactions include maculopapular rash, lichenoid reactions, vitiligo and pruritus, with severity Grade 1 or 2. Less frequent but eventually life-threatening skin side effects, including Stevens-Johnson syndrome, Drug Reaction with Eosinophilia and Systemic Symptoms and Toxic Epidermal necrolysis, have also been reported. 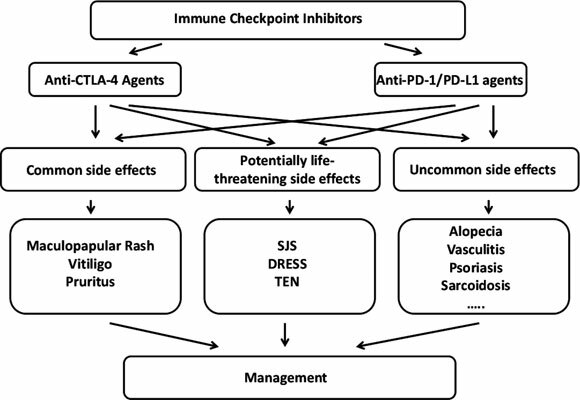 Conclusion: Basic knowledge of the Immune-Checkpoint-Inhibitors-induced skin toxicity is necessary in order to recognize these treatment-related complications. The most frequent skin side effects, such as maculopapular rash, vitiligo and pruritus, tend to subside under symptomatic treatment so that permanent discontinuation of therapy is not commonly necessary. In the case of life-threatening side effects, apart from the necessary symptomatic treatment, the immunotherapy should be permanently stopped. Information concerning the management of ICIs-mediated skin toxicity can be obtained from the literature as well as from the Summary of Product Characteristics of each agent. Cutaneous adverse reactions, immune checkpoint inhibitors, management, melanoma, skin toxicity, therapy.